The wot-tac is the revolutionary course calculator that is simple and easy to use. No more mathematical calculations. Plan your race with certainty. If it’s rough weather and you cannot see the gybe mark, the wot-tac will tell you what to steer. No more getting to the windward mark and following the pack. Using the wot-tac you can be confident of getting the numbers right. 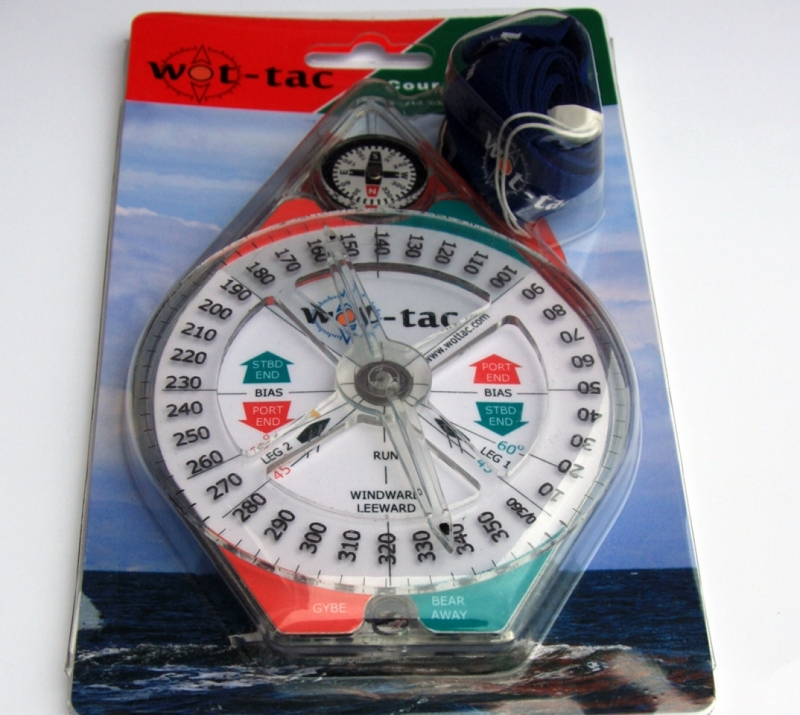 Wot-tac is boat shaped with a compass on the bow and a centrally mounted dial etched with 3600 markings. On the top of the etched dial is an arrow that can be used when the wind shifts – see the section below. For the dinghy racer winning is everything. Getting round the course in the least possible time wins races. At wot-tac we have years of experience in racing and it was from the desire to win and be the first in the clubhouse that wot-tac was born. Jonathan Abrahams, the inventor of the wot-tac, had spent too much time racing with poor visibility, looking for the gybe mark without being sure of the correct compass course. He knew there had to be a way of predicting the wind direction. And wot-tac came to fruition. Jonathan’s story is on the wot-tac inspiration page of this web site. The wot-tac is so easy to use it really is unbelievable. Just set the wind direction into the device and away you go. The wot-tac can be kept in a pocket or hung round your neck with a lanyard. 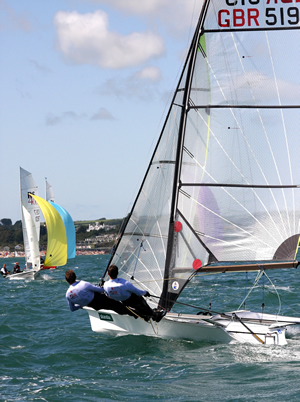 It’s design makes it straightforward and hassle-free to use in the hectic atmosphere of the racing dinghy. The wot-tac is now ready to be used. Keep Checking the wind before the start. Write down the two reaching leg courses, whether Olympic 60deg. or trapezoidal 45deg. as marked on the wot-tac by leg 2 and leg 3. The run leg is also noted as the reciprocal of the wind direction. Unless there is a wind shift the wind direction bearing remains the same. DO NOT MOVE the dial unless there is a significant wind shift. 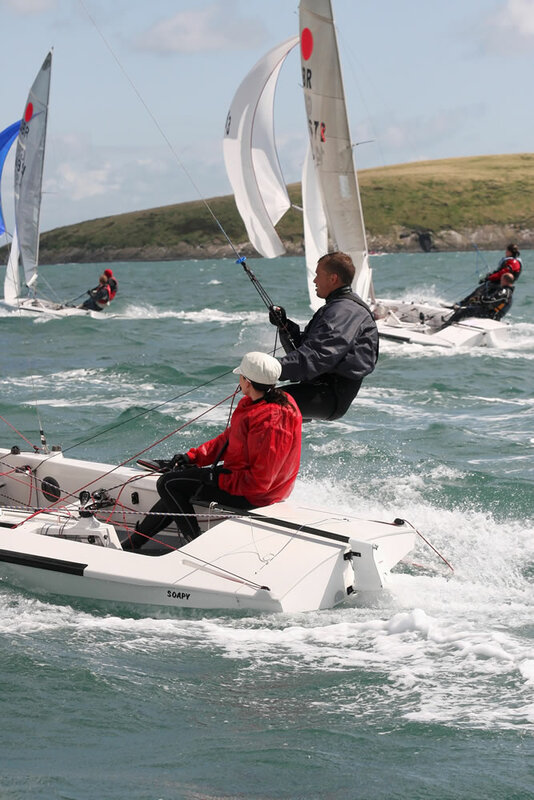 The wind can change many times during a race and the sailor has to be vigilant to ensure that any change in the wind is measured and noted correctly. But the wind change can have a bearing on how you sail the boat especially as you approach the two reaching legs. If there is a significant wind shift during the race you can move the dial to the new tack angle on either port or starboard when hard on the wind. 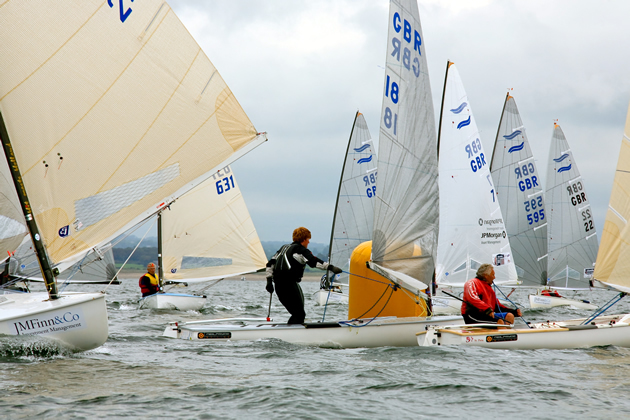 The two reaching legs will remain the same as before but the sailor can determine whether a gybe set or a bear away set is used on the run course. Move the dial but not the pointer and the pointer will now indicate whether to a gybe set or bear away set should be used for the run leg. It is not necessary for the dial to be changed once it has been set up with the true wind direction. 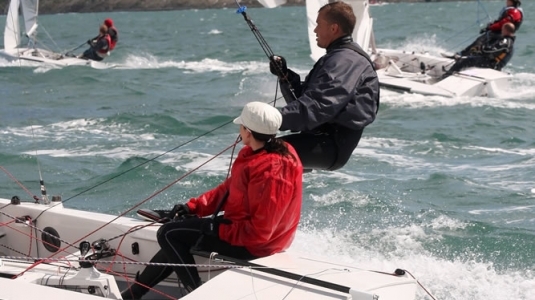 The wot-tac enables the dinghy racer to read off all the legs of a race in advance in case of poor visibility when the marks cannot be seen at a distance. Using wot-tac makes life easy when you’re planning the race. This is how its done. First thing is to follow steps one and two earlier. Then sail to one end of the start line or the other, line up the two-committee boats and read off the bearing on the wot-tac. If the line is perfectly square the line should read 90/180 degrees to the wind direction. 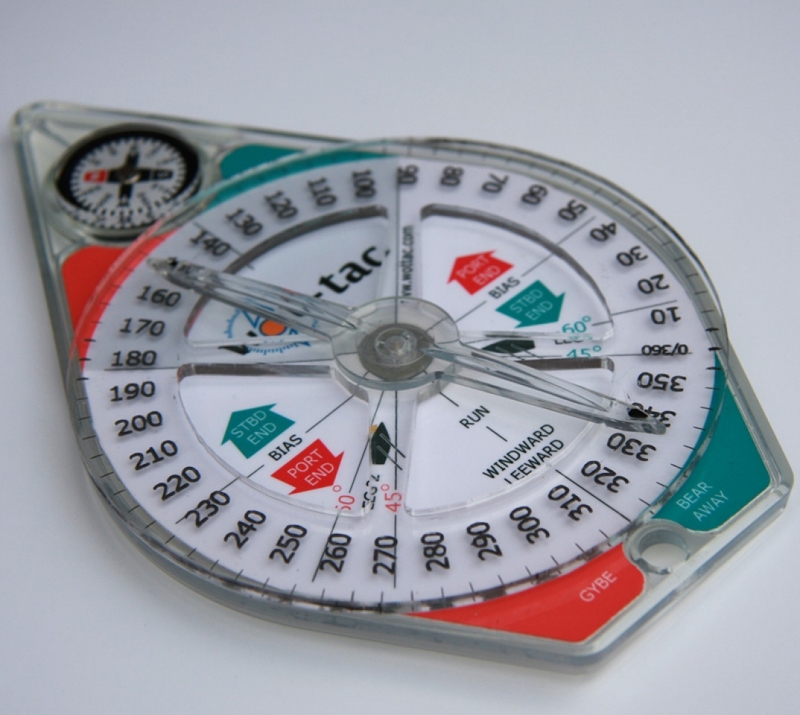 If the compass reading is NOT perfectly square the wot-tac will show which end is favoured by the green or red arrow indicator.